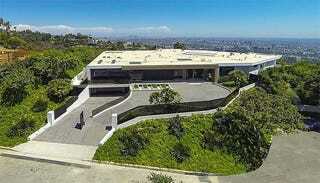 In case you needed a material transaction to illustrate just how much money Markus Persson, aka Notch, has having sold Mojang (and Minecraft) to Microsoft, take a look at this: the dude just paid $70 million (and maybe beat out Beyonce & Jay-Z) to buy the most expensive house in Beverly Hills. Persson's purchase included everything in the house from luxury furnishings to exotic electronics such as the automated 54–foot curved glass door in the living room that opens onto an infinity pool with iPad-controlled fountains and spectacular views. Cases of Dom Perignon were part of the deal. ...vodka and tequila bars, a candy room, an 18-seat tiered screening room, a state-of-the-art kitchen and an exquisite 18-foot onyx dining room table for 24 that includes place settings by Roberto Cavalli at a cost of $3,700 each. Three high-definition 90-inch television screens bring panoramic views of Los Angeles from the roof into the down stairs lounge – especially breathtaking at night, says De Los Reyes. Art pieces include a replica of James Dean's motorcycle and a chromed Ma Deuce machine gun. On a conventional note, the home has eight bedrooms and 15 bathrooms all equipped with Toto Neorest toilets at a price of $5,600 each. It's unclear yet whether Persson intends to demolish the house and turn it into a bunch of giant cubes. Here's a video walkthrough of the house. It's ridiculous. And here's a tweet Persson sent out earlier today, showing him chillin' in his new digs.